Vocabulary can often be a challenge for students. Combine writing skills, vocabulary acquisition and intimate knowledge about that very special novel into a unique project where students create their own ABC books about the novel. 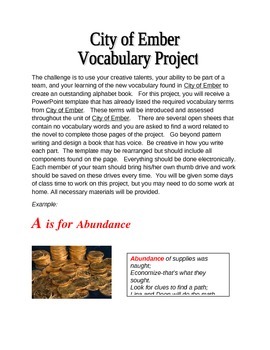 The City of Ember was the catalyst for this endeavor to integrate a variety of language arts skills with the vocabulary of this novel by Jeanne DuPrau. A template for the project, an exemplar to share with the class, and directions along with a rubric are part of this package.